It was September 8th, the feast of the nativity of the Virgin Mary, and the ships of what would be remembered as the "Gran Soccorso" were reaching the waters of Malta. On the walls reduced to a heap of ruins, the banners of the Holy Religion were flying. This was the conclusion of one of the most glorious pages in the history of the Christian West. The Knights of St. John of Rhodes and Malta, not only defeated the army of Islam, but humiliated the fanatic certainty of the superiority of an Empire. Some days later Jean de la Vallette marked another score against Suleiman. His secret agents, the same men who had constantly informed him on the movements of the adversary, burnt down the arsenal of Constantinople. This was a venture which deeply demoralised the old Sultan who, for the first time, felt himself being threatened within the capital of his kingdom. But the victory did not distract the Grand Master and the Chapter away from their duties. The Siege had shown that the defences were weak and it was necessary to reinforce them in time. It was useless to deceive themselves: sooner or later the Turks would come back to seek revenge for the stinging defeat they had suffered and it was necessary to get ready. Ever since his arrival in Malta, Jean de le Vallette had toyed with the idea of building a large city on the highland which dominated the country. This was an idea that he could now finally realise. The task of drawing the plans for the project was given to an architect Francesco Laparelli from Cortona, and the Grand Master gave him very short time to complete the work. The old soldier was in hurry to put his island in a condition to resist against a return of the enemy. 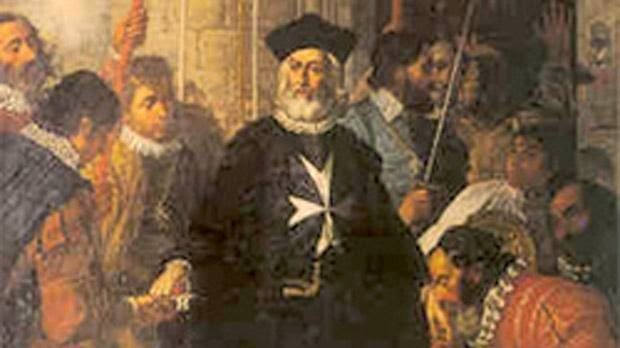 He infected his assistants with his enthusiasm and only months later, on March 28th 1566, during a solemn ceremony the Grand Master placed the first stone of the city that was to be named after him, Valletta. Francesco Laparelli helped by his Maltese assistant, Gerolamo Cassar, made of this capital an example of architectural style. New and marvellous Auberges, palaces and churches rose, and in the midst of them, St. John's Conventual Church. The face of Malta changed. It was no longer only the stronghold of the Knights, but now also a splendid monument to art and faith. The care of the Hospitallers changed the dry and inhospitable island into a jewel that is still admired today. The building of Valletta was followed by the re-organization of the port and the creation of new gardens and other strong and elegant fortifications. It was a work of embellishment carried out over two centuries which witnessed the continuity of ideals and intent among the different heads of the Order who followed one another. Between 1657 and 1660 Grand Master, Fra' Martin de Redin strengthened the defence system by building fourteen coastal towers and between 1660 and 1680 Grand Masters Raphael and Nicolas Cotoner erected a huge fortified complex which would be called the 'Cotonera Lines". The great Arsenal of Italy was built thanks to Admiral Girolamo Salvago and all the Langues contributed towards the decoration and embellishment of their own Auberge and towards enriching their Chapel in the Conventual Church of St. John, upon whose floor are laid out the tombstones of the European nobility making it a work of very high artistic value. Jean de la Vallette, the heroic victor of Suleiman, died on August 21st 1568. The work yards closed for two days in sign of mourning, just enough time to elect the new Grand Master, Fra' Pietro Del Monte, Pilier of the Langue of Italy. He immediately ordered that the building of the city be resumed with new enthusiasm.